Improved graphics and much more realistic environments. Expanded wolf customizations: wolf coats, injured body parts, and howls. 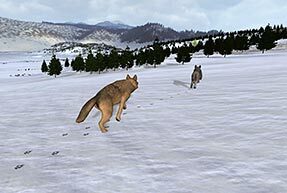 Completely rewritten animal AI: smarter mate and pups, and more challenging prey. New animals: Cougars, moose, foxes and ravens! More robust and reliable multiplayer. Public games offer text and phrase chat. Private games offer voice, text, and phrase chat. New map to explore in single-player and multiplayer games. Player accounts with achievements, friends list, packs, and in-game messaging. 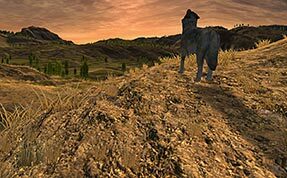 Plus all of the great gameplay of the original Wolfquest: hunting elk, meeting stranger wolves, finding a mate, establishing a territory, and raising pups. Read the manual for full specs and gameplay descriptions. Why are we charging for the new version? 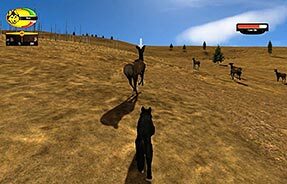 Ten years ago, WolfQuest was funded by grants from the National Science Foundation, Best Buy Foundation, and other sponsors, which allowed us to make the game a free download. Funding ran out in 2011, and so no further development of the game was planned. However, interest in the game remained strong, so we gave it a much-needed overhaul and expansion and released WolfQuest 2.7 in 2015. Now WolfQuest game development and support is funded through game sales. We appreciate everyone supporting WolfQuest's ongoing development! We are currently working on WolfQuest 3: Anniversary Edition. Learn about the history of the game and follow our progress remaking the game in our weekly Developer's Blog! Nostalgic for the old free game? 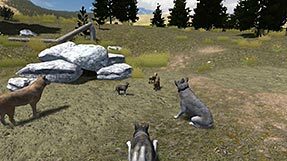 WolfQuest 2.5, the previous version of the game, is still available as a free download here, but please note that game accounts no longer work in it. Available for Mac & Windows computers! Try the free demo, then purchase the entire game with wolf pups, multiplayer modes, 30 new wolf customizations, a mysterious new map, and dozens of other great new features. Price: $10. Do players think it's worth the money? Read this! Your purchase comes with a Steam key. The Steam version includes Steam achievements, trading cards, badges and more! You can also buy the game on Steam or the Humble Store (to get a Steam key). We receive a smaller percentage of money from purchases on Steam compared to itch.io, so we always prefer that you purchase on itch.io, then claim a Steam key to get it there. But you're welcome to choose your preferred marketplace. Or get it for iPhone & iPad or Android or Kindle!